Fantasy role-players lead a young hero through a lifetime of adventure in Dragon Quest V: Hand of the Heavenly Bride. The hero of the story is born, grows up, marries, and has a family of his own within the timeframe of the game, as the plot focuses on his most poignant and heroic deeds. The 2009 DS edition of Hand of the Heavenly Bride is a remake of the fifth original Dragon Quest game published by Enix, which was the first in the series made for Nintendo's 16-bit Super Famicom console in Japan and never before released in North America. Players control a party of warriors and wizards who travel the land serving justice, battling evil, and pursuing great quests. Players control the party membership, even accepting some defeated monsters into the group if they choose, and selecting new skills as party members level up and become more powerful. Battles are turn-based and team-oriented. 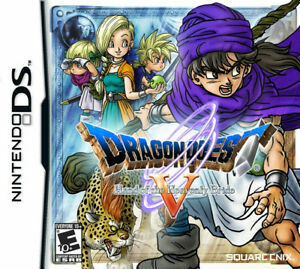 Similar to earlier Dragon Quest games on DS his remake features new content, a streamlined touch-screen interface, and rich, detailed animations and backgrounds. Other additions on the portable platform include a selection of mini-games and customizable knick-knacks that can be traded with other players over a wireless connection. Play original mini-games! Collect and trade knick-knacks! Directe betaling van US $40,90 is vereist.